When someone sees a multirotor aircraft for the first time, they are usually amazed at how they fly. One question constantly asked about multirotors is, “How do these things fly without any control surfaces?” That is a good question; let’s take a closer look at the physics of how multirotors fly. Since there are no control surfaces on a typical multirotor, the only way you can maneuver the craft is by changing the speeds of the motors. This, in turn, changes the amount of thrust produced by the motors. This imbalance in thrust is what makes the craft deviate from a stable hover and move in various directions. In any multirotor craft, some form of flight control board is required to go between the radio receiver and the speed controllers for the motors. The job of the flight controller is two-fold: First, it interprets the command signals that come from the radio receiver in the form of pitch, roll, yaw and throttle and converts them into the variations of throttle command needed to control the craft. Second, when a stability mode is active, it acts as a gyro stabilization module to keep the craft upright and level when no control commands are given. 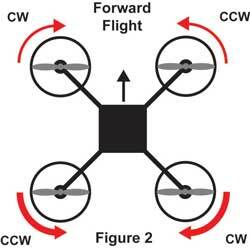 Without a flight controller board, flying a multirotor aircraft is virtually impossible. To assist in the description of the various flight modes, a diagram of the top view of a Quad-X platform multirotor will be used. This is the most common configuration flying today, so it will be most applicable to the discussion of flight principles. Referring to Figure 1, this illustration shows the quad in a stable hover. The black arrow indicates the front of the craft and the direction of forward travel. The red arrows around each of the motors indicate the direction and speed at which the propellers are turning. In this illustration, all four red arrows are the same size, which indicates that all four motors are spinning at the same speed and the arrowheads indicate the direction that the props are turning. In this condition, each motor is producing an amount of thrust equal to one quarter of the weight of the airframe, and when the thrust of all four motors is combined it is equal to the weight of the craft which neutralizes the effect of gravity that is trying to pull the machine back to earth. With no other forces applied, the craft will stay in level flight at a consistent altitude. In order to make the quad move, one or more of the motors will need to speed up, while others may need to slow down, depending on the desired outcome. Figure 2 shows what happens if you want the quad to move forward. The two back motors both speed up an equal amount, as indicated by the bolder red arrows and the two front motors slow down an equal amount, as indicated by the lighter red arrows. This imbalance in thrust causes the back end of the craft to lift up while the front end drops down. Once the correct angle is achieved the motors go back to a speed that is little faster than their original hovering speed and the craft moves forward. Since the craft is now tilting at a slight angle, some of the lift force is directed forward, which continues to pull the craft along in the forward direction. A small amount of the lifting force is lost, and that is why the motors need to spin a little faster to make up the difference. To go backwards, the opposite occurs. The front motors speed up and tip the craft backwards and then the four motors return to a constant speed as the craft comes back toward the pilot. To transition back to a stable hover, you have to give opposite control for a few seconds to stop the movement of the craft and then return the stick back to neutral once again when the aircraft stops moving. 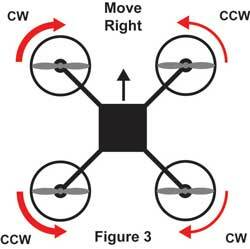 To move the Quad right and left, the same process is used, except different motors speed up and slow down. In Figure 3, the diagram shows what happens if you move the control stick to the right. The two left motors speed up, while the two right motors slow down. Once the craft tilts to the correct angle the motors’ speeds equalize and the machine starts moving to the right. To go left , the exact opposite occurs; the two right motors speed up while the two left motors slow down and the machine tilts to the left and starts moving left . As before, to return to a stable hover, opposite control is given momentarily to stop the movement and then the control stick is returned to the neutral position. When the craft is in a level hover and you have a flight controller that includes accelerometers, the board can actually sense the force of gravity and know which way “down” is. By aligning itself with respect to the force of gravity, the flight controller board can self-level the frame and hold it there, even if it is disturbed by an outside force, such as a wind gust. 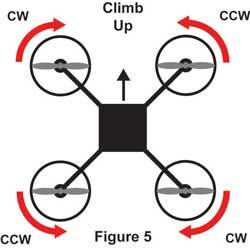 The next control movement often confuses those who are new to multirotors. 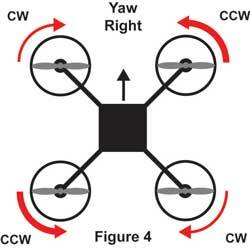 How exactly does a quad yaw or rotate left and right? In a quad, as seen in the previous figures, two of the motors are spinning clockwise while the opposite two motors are spinning counter-clockwise. In this condition the natural torque tendencies of one pair of motors is cancelled out by the torque of the opposite pair and the quad does not rotate. Looking at Figure 4, to make the quad rotate to the right the two counter-clockwise rotating motors are sped up, while the two clockwise rotating motors are slowed down by the same amount. This keeps the total lift generated the same, because the amount of thrust gained by the faster turning motors is the same as the amount of thrust lost by the slower turning motors. However, the torque moment generated by the counterclockwise motor increases while the torque moment of the clockwise motors decreases. This results is a net torque increase that causes the entire quad frame to rotate clockwise. Conversely, to yaw to the left , the two clockwise rotating motors are sped up while the two counter-clockwise motors are slowed down and the net torque difference rotates the quad frame to the left. The last flight direction that needs to be covered is changes in altitude. Figure 5 shows that in order to climb, all four motors speed up by an equal amount, and the net increase in thrust causes the quad to climb up. To descend in a quad, the opposite happens. All four motors are slowed down by the same amount and the net loss of thrust causes the craft to come back down under the pull of gravity. All of the maneuvers discussed thus far are basically transitions in and out of stable hover flight. If the flight controller board in your multirotor has an acrobatic mode, without self leveling capability, then you can also do maneuvers such as loops or rolls by moving the control stick far enough and continuing to hold it there. In a loop, the extra lift of the front motors will continue to pull the front of the craft up and over the top and then back around into level flight. Before attempting a loop in a quad, make sure that you have sufficient altitude! Multirotor aircraft typically use fixed pitch props, so when you get upside down, the machine will really start falling fast! In a quad, quick loops can be done by performing a climb up, followed by a flip over at the top. You can also loop a quad from forward flight and get a nice round loop, as long as you are going forward fast enough so the centrifugal force pulling the craft to the outside of the loop is greater than the force of gravity. Flip rolls can be done from level hovering flight, as long as you do them quick and are high enough off the ground. Rolling a quad from forward flight is much like rolling a trainer aircraft with a flat-bottom airfoil. You need to pull up a bit to establish a slight upward angle before you start the roll. The altitude you lose during the roll will get you back into level flight as you exit, or slightly nose down, which you can correct for with a bit of back stick. That pretty much covers the basics of how a multirotor craft flies without any control surfaces and hopefully, explains some of the physics involved with these fascinating models. Once you understand the physics behind them, the operation of a multirotor is much less mysterious. Next time different types of multirotor configurations will be presented and the pros and cons of each type will be discussed.